This week brought the announcement of what was probably the most eagerly awaited baby news in the UK, and quite possibly in the world. The child in question will be one of the most privileged around, and is able to lay claim to a very high-profile father that everyone wants to meet. 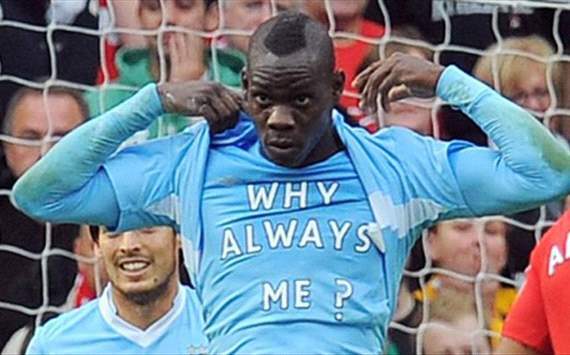 It is, of course, Mario Balotelli’s newly-born baby girl, reportedly named Pia Fico. Forget Kate and Will’s royal baby. Yes, it will probably have a gold encrusted cot and its own bathroom in Buckingham Palace, not to mention holding the enviable position of heir to the throne of England, but will their dad have a camouflage ‘onesie’ that matches his Bentley? No, he won’t. Little Pia may not get showered with the same royal jewels and riches as Kate and Will’s child is likely to, but she is sure to never have a dull moment – with firework shows in the Balotelli household a regular entity. The controversial Manchester City striker missed the birth of his child, who arrived three weeks early after originally being due on Christmas Eve. It is unclear whether the 22-year-old will now return to Italy to see off-on girlfriend Raffaella Fico and his first-born, but reports suggest he has spent thousands of pounds on a hand-painted Disney mural for Pia’s nursery. The couple’s relationship had been on the rocks for some time earlier in the year, with Balotelli denying paternity and asking for DNA tests when Raffaella said she was pregnant. However, the Italy international is apparently delighted at the birth. Next Next post: Balotelli is a liability, Welbeck is an average player – do Manchester City or Manchester United have the better striker?